Panelists George Arwady (left) and Mark French. Continuing a theme from his earlier keynote speech, Jason Feifer, editor in chief of Entrepreneur magazine, encouraged his audience at another session at the recent New England Newspaper and Press Association winter convention to get uncomfortable in their ways of thinking and storytelling. The session featured an interactive, team-building component, during which three groups of 10 to 15 people collaborated to pitch an idea to Mark French and George Arwady of The Republican of Springfield, Mass. French, the Republican’s advertising director, and Arwady, its publisher and chief executive officer, stressed the need for members of the audience to pitch innovative and practical ideas, because the two of them would seriously consider using the new ideas at the Republican. “We are in an industry where traditional revenue is in decline, so how will we more than replace that?” Arwady asked. Arwady said a lot of the Republican’s own entrepreneurial ideas have focused on brand extension. Newspapers are the most powerful brand in the market, and there is an amazing ability to extend the brand in multiple directions, he said. French discussed previously uncomfortable ideas that are now used at the Republican. “We are absurdly entrepreneurial,” Arwady joked. One of French’s examples: The potential for revenue growth from obituaries by maximizing the experience for readers and for funeral directors, because obits are the most-read feature of the paper. To take advantage of that potential, French introduced what he called the funeral director spotlight. The spotlight provides a funeral director with a plaque memorializing the Republican obituary placed by the funeral director. Families of the deceased complain about the cost of obituaries, and often these complaints fall first on the funeral director, French said. The obituary plaque can help mitigate the pain of losing a loved one and provide tangible memorabilia from the obituary. That satisfies the families and the funeral directors, French said. “For every single obit we (publish), we have a wooden plaque made with the obituary and photo mounted on it,” French said. The plaques are then delivered to the families of the deceased, he said. French said Republican staff members showed the plaques in visits to funeral home directors. They told the directors: Next time a family complains or has concerns about the cost of an obituary — the average cost is $350 for a relatively small obit, French said — show the family the plaque as a way to enhance the value of the cost of the obituary and to help the family cope with the loss of a loved one. He said the Republican has received more thank-you notes about the plaques than imaginable. The funeral directors get accolades too because sometimes they get the credit for the plaques, French said. Since instituting the funeral director spotlight and other changes, there has been a six-figure increase in revenue from obituaries, Arwady said. The three groups created to pitch ideas considered ideas for about 40 minutes before Feifer asked each to pitch their thoughts to Arwady and French. The first group offered an idea of uniting the community of Springfield, and all of the different cultures that embody it. “You have always been the center of Springfield; be the community center of Springfield,” said Jennifer Zarate, a multimedia journalist with The Wellesley (Mass.) Townsman. That group suggested that the Republican could host language classes, offer child care, or bring the community together online. The revenue would come from paid sponsorships by sports leagues, business developers and others. “It’s a way to make the newspaper a thought leader and something the community wants to be involved in. It might not be something you can put a dollar amount on immediately, but it’s something that builds trust,” said a member of the group. The second team, represented by freelancer Carolyn Shapiro of Burlington, Vt., said the Republican should allow companies to pay to “take over” the newspaper’s social media feed. The payment would be based on how long the company takes over the feed, she said. Shapiro proposed other obituary-related innovations for the Republican beyond what it has already added, and discussed how her group brainstormed the idea of rebuttal obits, in which people could write brutally honest and vulgar pieces about themselves that will not be published until they are dead. The panel and members of the audience shared a laugh, but Shapiro was serious, and Arwady and French noted that there was a lot of merit to the idea. “The column should be called ‘Peace Out’,” Feifer joked. “I’m feeling really uncomfortable, like I’m wearing burlap underwear,” French said. The final group suggested turning the newsroom into a multi-disciplinary makerspace where people with common interests could come together to explore ideas or work on projects together. The makerspace could include options to rent conference rooms and pay fees to use equipment. The space could be a startup incubator, where new companies could establish themselves and rent the space until they have enough revenue to expand independently or own their own space. The final group also recommended that the newspaper host events, similar to the first group’s community center proposal. Examples given included bridal expos and workshops for high school and college students. Guests would pay fees to attend. Feifer asked the panelists which idea was the most feasible. French said that although all of the ideas were great and definitely entrepreneurial, the one that was most feasible was a community-centered makerspace and event hosting. Arwady said he especially would want to cater to the Spanish-speaking community. Arwady also said he loves the idea of rebuttal obits, and could even transform it to apply to companies going out of business, where they could feel as though they could tell the whole world why it isn’t fair that they had to shut down. All of the ideas offered multiple ways to engage the community and to show that newspapers are inseparable from the community, French said. “Having that kind of core value is priceless; there’s no way you could put a monetary value on that,” French said. 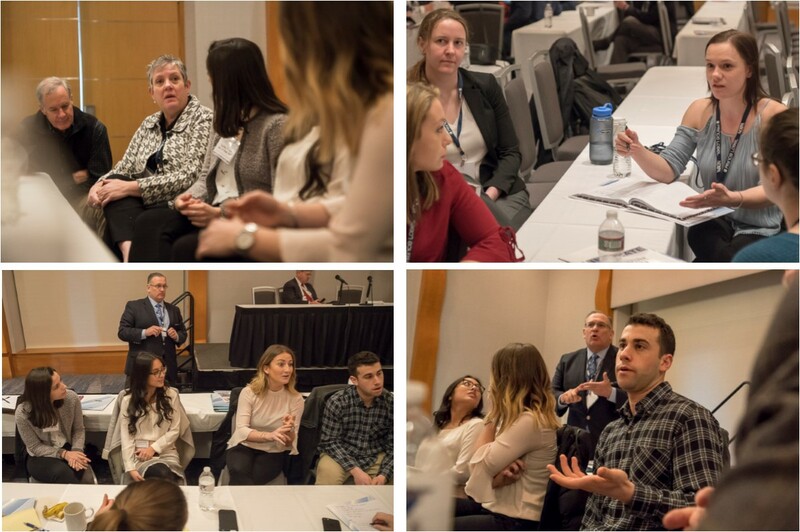 The session, titled “LIVE: Creating a New Product,” was held Friday, Feb. 23, at the Renaissance Boston Waterfront Hotel. Members of the audience split into groups to come up with ideas for new products to propose to panelists from The Republican of Springfield, Mass.